Taking a break from election results, NBC News has released a few excerpts from Matt Lauer‘s wide-ranging interview with former Pres. George W. Bush as he promotes his new book. He talks about 9/11, about Donald Rumsfeld and a lot more. But he also talks about Kanye West. Wow. We’ll have more on this as the week goes on. 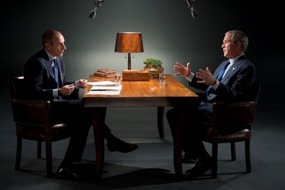 The interview airs Monday at 8pmET on NBC as part of an hour-long special, and Pres. Bush will be live on Today next Wednesday. The image is from the interview.